This Special TV offer starts with the Rocket Balloon Fun Set which gives you 50 reusable rocket balloons and a two-way action pump. 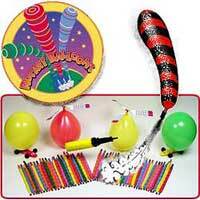 Then we add two great fun flying helicopter balloons and two fast racing jet cars. And if that is not enough, we give you an additional Refill Pack of 25 rocket balloons giving you a total of 75 rocket balloons.